Permanent Works of Art! 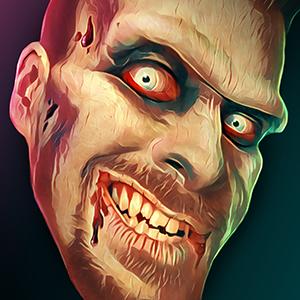 - Zombie Pumpkins! Any creepy topic that doesn't fit the categories below. I realized. 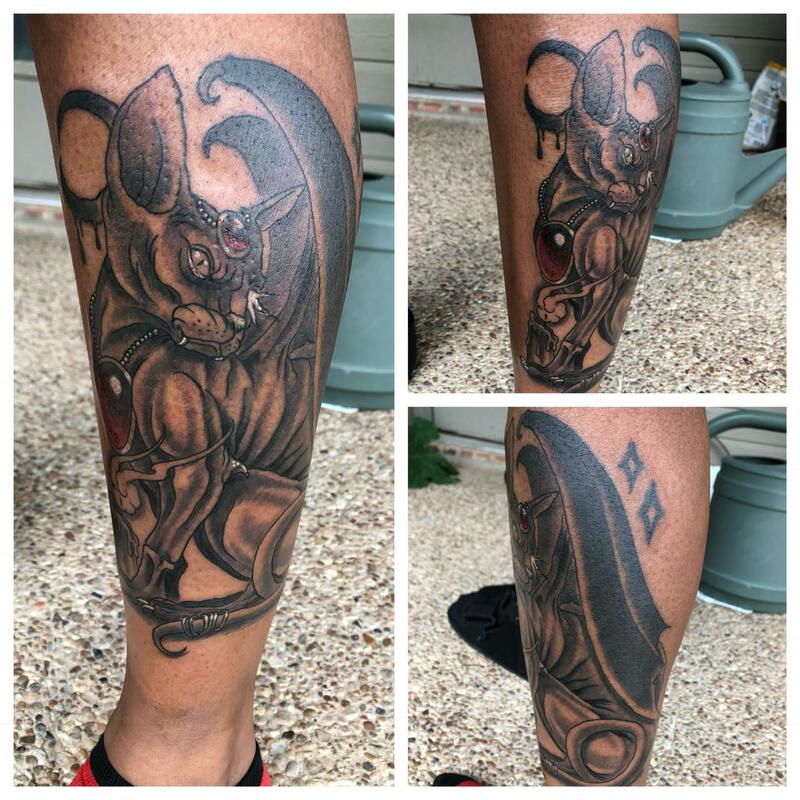 That I have not yet seen a dedicated thread for tattoos of our members! Some of the members have seen this already. But I wanted to share it here as well! My (soon to be) three tattoos! And now.... MY ZP! INSPIRED TAT! Last edited by SuperSonic on Wed Oct 17, 2018 8:56 pm, edited 1 time in total. When witches go riding and black cats are seen. 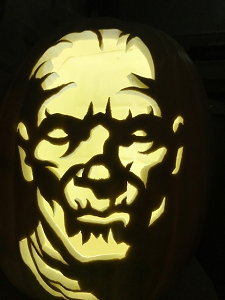 The moon laughs and whispers, TIS NEAR HALLOWEEN! 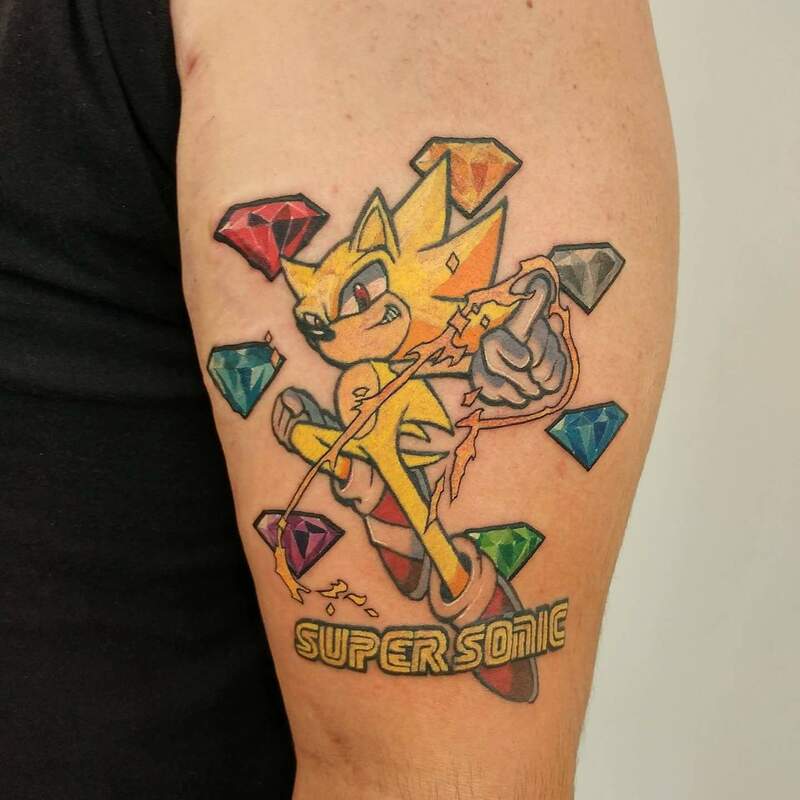 SuperSonic, your Rogue One and Super Sonic tattoos are great. The composition and shading is really nicely done. Some creative arrangements of elements, like Sonic with the Chaos Emeralds and Sega font. But that Patch Master design... OH MY GOURD! I'm biased, but I love the composition of things in this! It's so dynamic. From the bats in the distance, to the pumpkins rolling into the foreground. The Patch Master scarecrow looks just as he should, with the curly, floppy hat, the straw sticking out, the long gnarly fingers, the long tattered coat with patches. And now I've decided... it's considered canon that he wears a crow skull on his hat! And you better believe I recognize all the familiar grinning jacks in the group. I'm honored, my man. And look, Oogie's boys are even lurking in there. Yes, I think the Patch master would be friends with them. 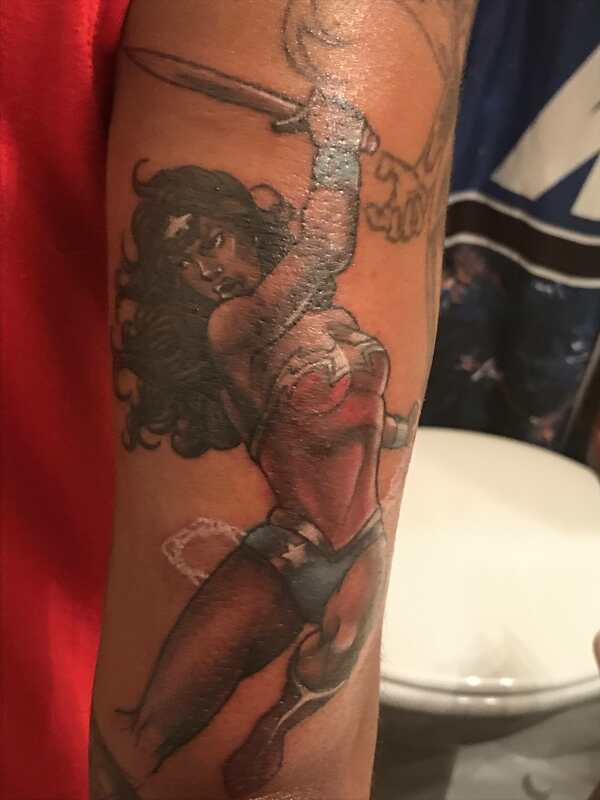 Is the same tattoo artist inking this piece? If so, it should look great. Can't wait to see the final product. Also can't wait to see everyone else's tattoos. I think we've shared some before, but go ahead and share again, or share your latest and greatest. I've been sending out Minion Mission rewards for tattoo lately, so now would be a good time to remind me if you have any ZP tatts. They look great, awesome tattoo artist. Is he also doing the designs? "Some people are born to use a chainsaw. Me. Well I got one attached to me. " This is one I had done about 4 years ago. It took about 20 hours. 11 of those hours were back to back to 6 and 5 hour sessions on consecutive days. I can't believe I made it through those sessions. In the Portland, OR area? Please check out my display! I want to only quote relevant bits of information, BUT IT'S ALL RELEVANT! You bet it's the same artist! He designed both the Rogue One and ZP! Tat from small refference photos I gave him. 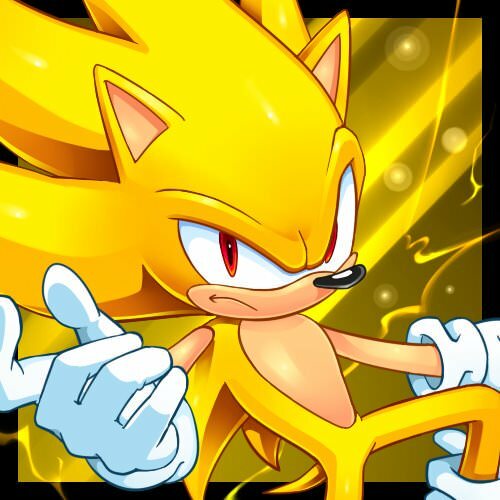 I designed (with a little help from the team who did the comics) the Super Sonic one. Alex (my artist) helped with the placement of the emeralds so that they would all be noticable. "Surprised weren't you? I knew you would be." I love that my artist made something cannon in ZP! lore. Rest assured I shall let him know when I see him for the piece tomorrow night! Minion Points for this though? I've been wanting that Face of the Minions patch for a while! My most recent horror themed tattoo is Medusa! Always been a fan of mythology, and I've wanted something like this for some time. I'm real happy with her! I hope to someday have the courage to just get a tattoo. I really want to get Michael's Thorn Tattoo. ZP! pic posted! It still needs color so it's not done yet! I'll probably never have any really elaborate tattoo's because I like to draw my own. Plus, I'm kinda weird about tat's in the first place. I love them, but I don't want anything really detailed on myself, and I have a limited number of places that I will get one. Those places are quickly running out. I've been wanting a Halloween themed tat for a long time now and today did this sketch. It's a work in progress as I'm still not sure what to do with the bottom of the tree and I'm not sure about the size ratio either. I want the pumpkin to be front and center which is why it's bigger than probably looks right. I'm no great artist so all that I do have are pretty simple. I'll get pictures of them all up soon... or at least the most recent ones I have. Plus some color and shading for this one and hopefully an actual tattoo soon. I have 30 tattoos so I’m just going to show a few of my favorites. 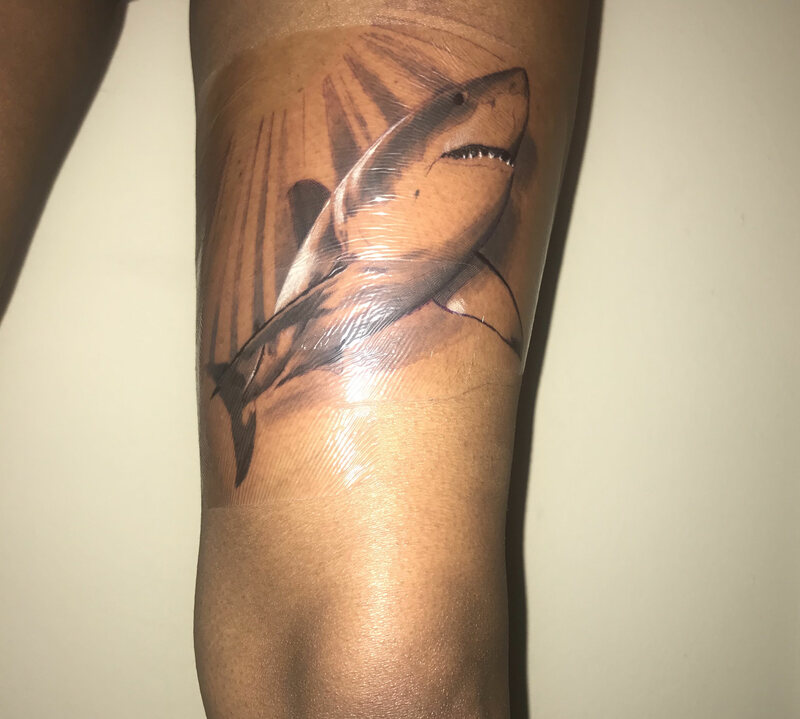 My newest one which is a winged cat, a Great White shark, Black Panther as Simba drawing, mermaid scales beneath my skin, Captain Phasma and Wonder Woman. 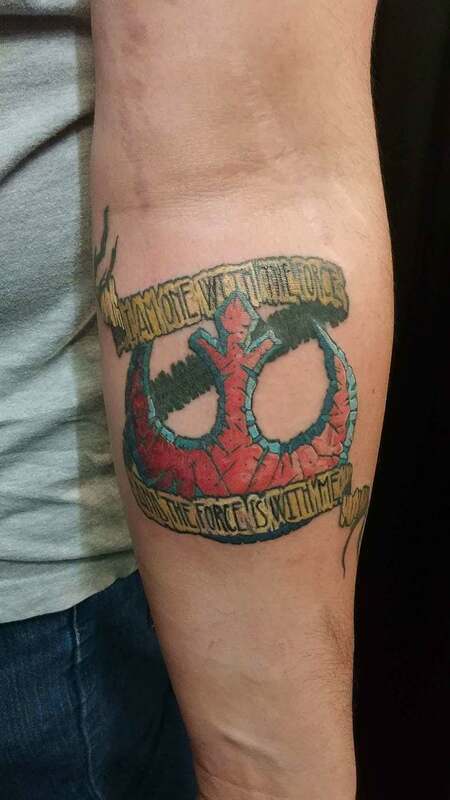 My other tattoos are all Disney, Marvel or Star Wars related as well. BrookR1 - Woah... much respect to your endurance! 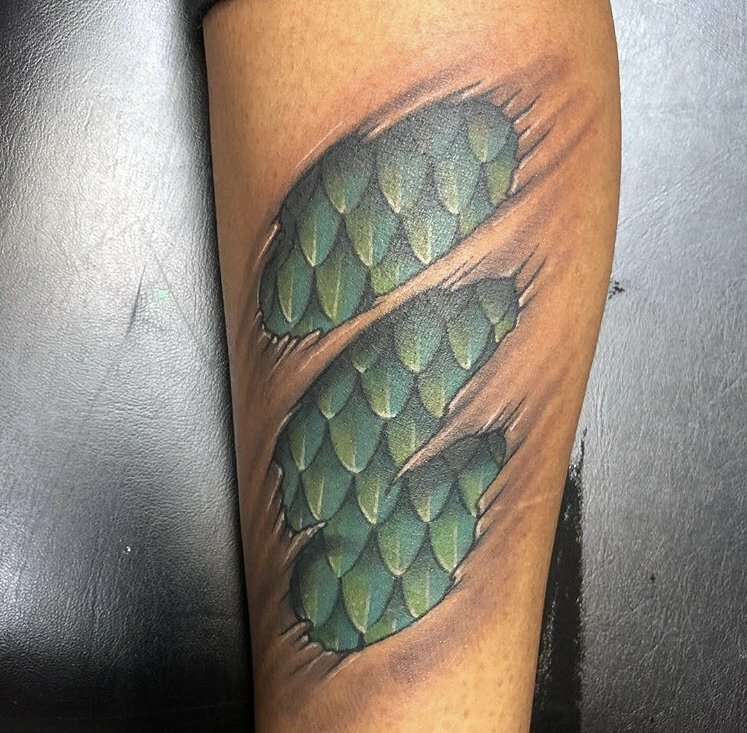 I've never received a tattoo, so I can only imagine how sore and worn down you'd get after so many hours of being buzzed and stabbed by those needles. 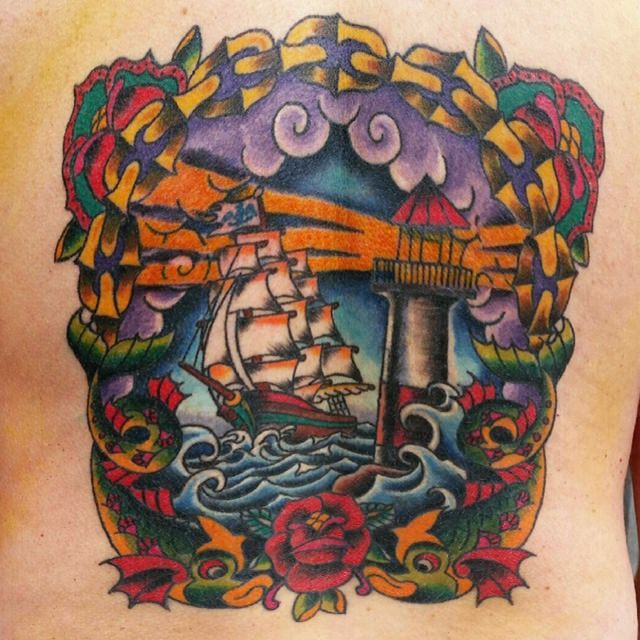 That colorful design is very classic though, I can see many elements of traditional nautical styles. 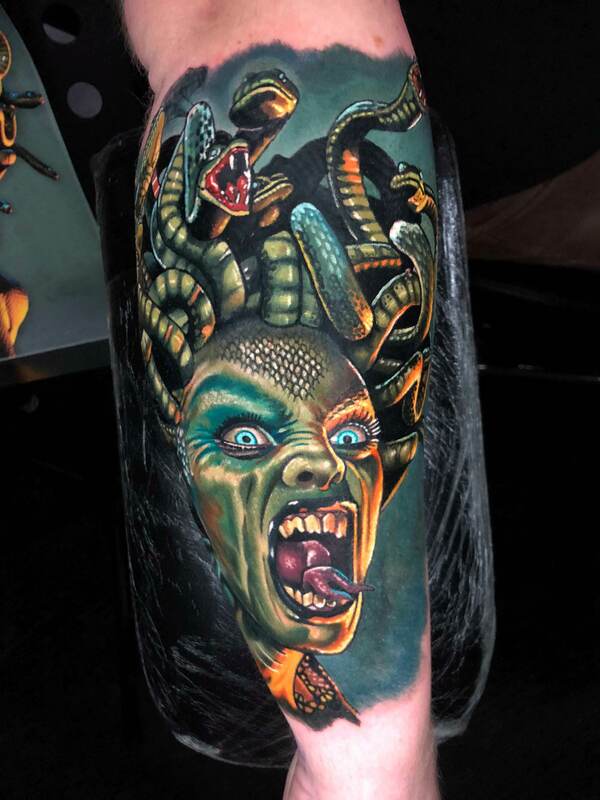 zombombie - I know you have some impressive ink, but that Medusa has to be among the best. It's amazing what tattoo artists can do these days. It looks like a painting! Is it based on a particular artist's rendition of the famous gorgon of myth? Looks familiar. Raven - Tattoos are very personal, and everyone has their guidelines for what works for them. I've seen some people who have a lot of tattoos, but they're all in the same style, like simple ink drawings. It's cool to see that much cohesion, like the whole body canvas was planned ahead of time, even if the tattoos are done over time. Did your sketch posted here before a reality? Skellington0327 - From what I can see, the tattoos you chose would be among my favorites too. Some creative and really fun designs going on. You wear your interests on your sleeve, quite literally. 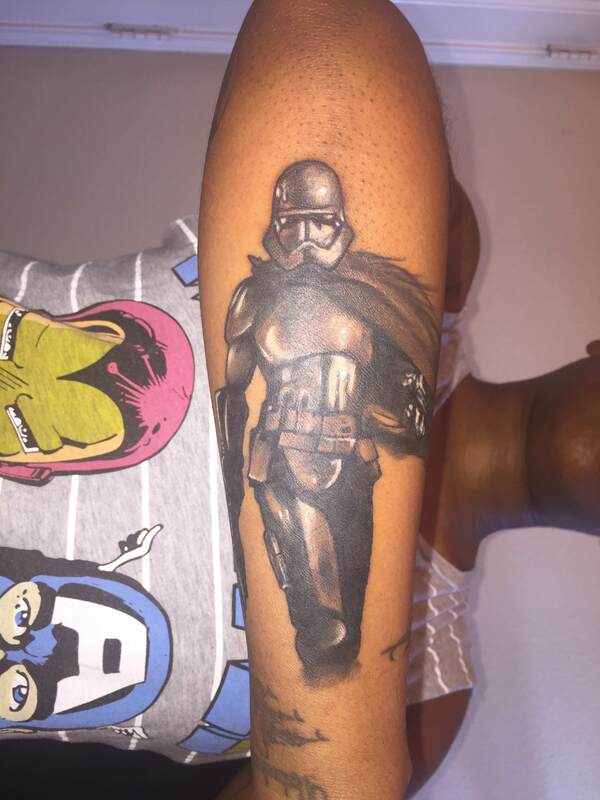 Did Disney already own Marvel and Star Wars when you got those tatts? If Disney buys great white sharks and mermaids, they'll have quite a monopoly on your body. SuperSonic - Do you have any more photos of your Patch Master tattoo? Or is it pretty much looking the same as the last image you shared? 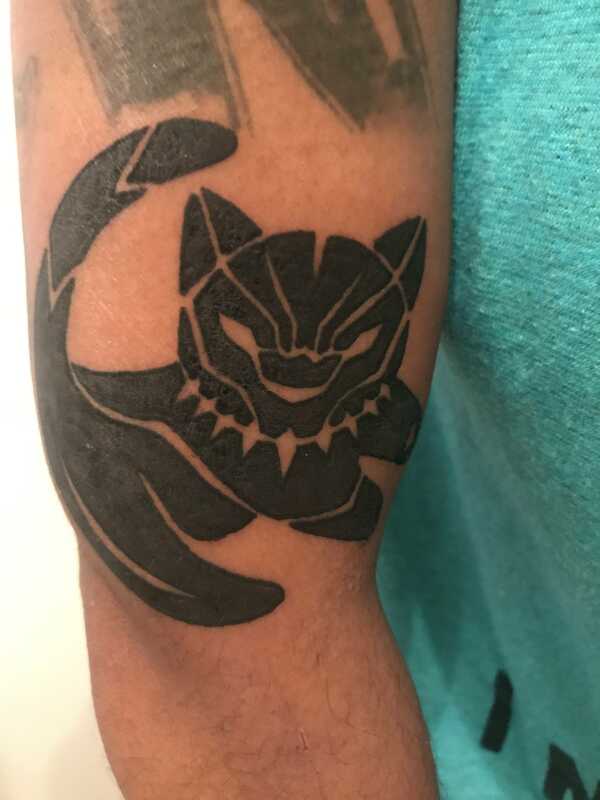 I don't have the actual tat yet, but it has evolved.... There will be color when it's finally on my skin. This is going to hurt.